Mayday! May day! Emergency!! Nah, it’s just May Day, aka the first day of May and VEDIM! May Day is a traditional spring holiday in many cultures, and an ancient springtime festival. It’s also International Workers’ Day, also known as Labor/Labour day. I’ll give some brief history about both of them! May Day’s earliest celebrations were pre-Christian, in Roman times. It was a festival called Floralia, celebrating the Roman goddess of flowers, Flora. There was also Walpurgis Night, celebrated in Germanic countries. It was actually a traditional summer holiday, because in pagan cultures, May 1 was the first day of summer. 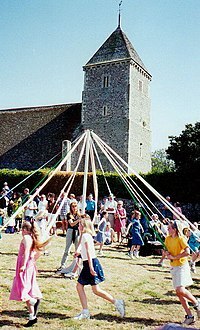 Later on as Christianity took over, May Day became a secular celebration, with maypole dancing and crowning the Queen of May. Since the 18th century, many Roman Catholics observe this, plus the whole month, with devotions to the Blessed Virgin Mary. Art, school skits, etc, will decorate or crown Mary with flowers. In 1955, Pope Pius XII chose this date for a feast to St Joseph as a counterpoint to the communist International Workers Day celebrations. Great segue eh? International Workers’ Day, also known as Labor/Labour Day in some countries. In the US, Labor Day was first made an official holiday by Oregon in 1887, and happens on the first Monday of September. By 1894, thirty states officially celebrated Labor Day and it was made an official federal holiday. Internationally, May Day was formally recognized as an annual event in 1891 at the second congress of Second International. That’s a pan-national organization of socialist and communist political parties. The date was chosen to commemorate the Haymarket affair that happened in Chicago on May 4th, 1886. This day was intended to demonstrate on the first of May for the legal establishment of a 8-hour day, class demands of the working class, and for universal peace. May Day has been a focal point for demonstrations ever since its establishment. It’s also a very important holiday in communist countries such as the People’s Republic of China, North Korea, Cuba and the former Soviet Union (USSR). There’s A LOT more info about both of these days online. Wikipedia has a whole list for May Day, how various countries have traditionally celebrated it and how they do it now. International Workers Day’s wiki is the same. They’re both linked at the end of this post. That’s all for today! Thanks for reading, and since it’s VEDIM, I’ll see you tomorrow!